Oklahoma Modern: Favorites: '80s Glam Sharpies! 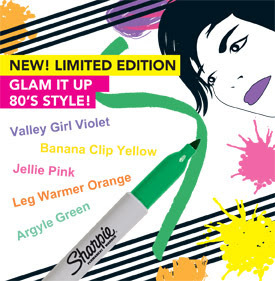 Who would have ever dreamed the blunt permanent markers known as Sharpies would ever become hip? It's true! The ubiquitous Sharpie is now offered in stainless steel, industrial-strength, even liquid pencil varieties. But that's not why it made our Favorites (insert thumping dance music). Sharpie gets kudos for creating a website filled with clever tips, artsy tricks and cool things you can do with their products. Check out Sharpie Uncapped for the coolest sampling of Sharpie Art and nifty how-to's from the Sharpie Squad. Oh yeah. It's Glam Night in Sharpie Town, baby! What's your favorite color: Leg Warmer Orange? Valley Girl Violet? Argyle Green?